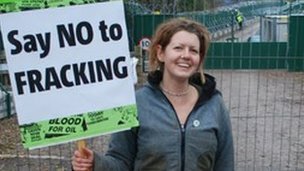 “I can’t see any benefits to fracking – it’s just a distraction from the real solutions which are needed to tackle our energy crisis. “Fracking won’t bring down energy prices or create many jobs, but investment in home insulation and renewable energy would. “Fracking has significant potential to pollute the air and contaminate our water supplies and it’s certain to contribute to climate change. “Renewable energy sources such as off-shore wind turbines are a much better way to generate energy. “The fact that the government is now resorting to handing out cash to local communities shows that they know they’re losing the argument. This entry was posted in Campaigns and tagged energy crisis, fracking, Green Party members, investment in home insulation, investment in renewable energy, off-shore wind turbines, Renewable energy sources, tamesidegreens by tamesidegreens. Bookmark the permalink. Reblogged this on E K H I.